The all-new CRF230M is street-ready for hours of urban and backroad adventure, with sporty 17-inch wheels and low-profile tires, plus a torquey, electric-start engine that boasts exceptional fuel economy. This agile street specialist features a dependable 223cc single-cylinder air-cooled four-stroke engine that pumps out plenty of user-friendly. Finally, the CRF230M packs CRF®-R-inspired bodywork and graphics to provide lots of style while you’re on the go. The all-new CRF230M is street-ready for hours of urban and backroad adventure, with sporty 17-inch wheels and low-profile tires, a torquey, electric-start 223cc engine that boasts exceptional fuel economy. – Motard-styling with a low and comfortable seat, allows maximum rider movement. – Aggressive 23.9-degree rake and 91mm of trail provide spirited handling. – Lightweight 17-inch wheels with sporty low-profile 70-series Dunlop GT401 Arrowmax tires. 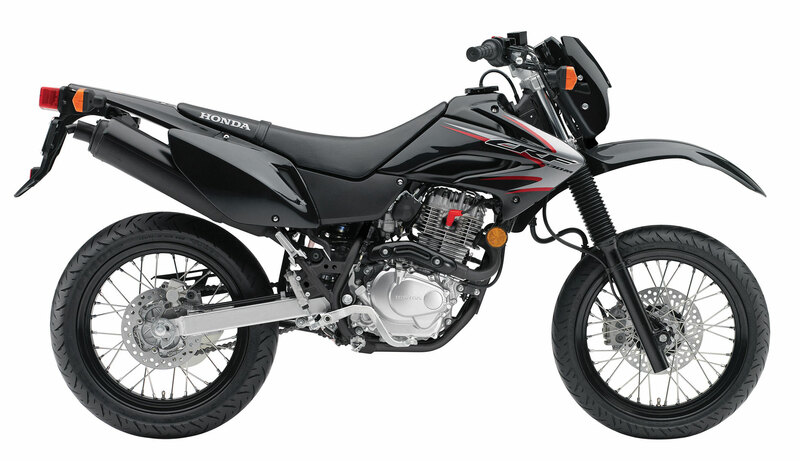 – Dependable 223cc single-cylinder air-cooled four-stroke engine offers plenty of user-friendly power and lots of torque spread over a wide rpm-range. – 30mm CV carburetor for crisp throttle response. – Electric start for easy starting. – Heavy-duty clutch offers smooth, progressive engagement. – Smooth-shifting, versatile six-speed transmission. – Heavy-duty O-ring – sealed chain for durability and reduced maintenance. – Wide box-section aluminum swingarm provides excellent rigidity to manage traction capability of large rear tire. – Lightweight semi-double-cradle high-tensile steel frame. – 37mm leading-axle Showa front fork offers 9.0 inches of suspension travel. – Heavy-duty Showa rear shock offers 6.6 (167mm) inches of travel for optimum front/rear balance. – Fork boots keep dirt and moisture away from fork seals. – Snail-type chain adjusters for easy maintenance. – Powerful 240mm front disc brake, and 220mm rear disc brake.- Road-ready, lightweight 17-inch wheels – 3.0-inch front, 3.5-inch rear – with straight-pull spokes. – Grippy Dunlop GT401 Arrowmax 110/70-17 front and 130/70- 17 rear tires. – Durable front and rear steel sprockets. – Wide cleated, folding, self-cleaning footpegs feature rubber-mount pads to minimize vibration and provide secure footing. – Cleated brake pedal provides excellent grip. – Quiet, USDA-qualified spark arrester/muffler. – Ignition switch key for added security. – Purchase of a new, previously unregistered Honda USA-certified unit by an individual retail user in the United States qualifies the owner for a one-year complimentary membership in the Honda Riders Club of America® (HRCA®).